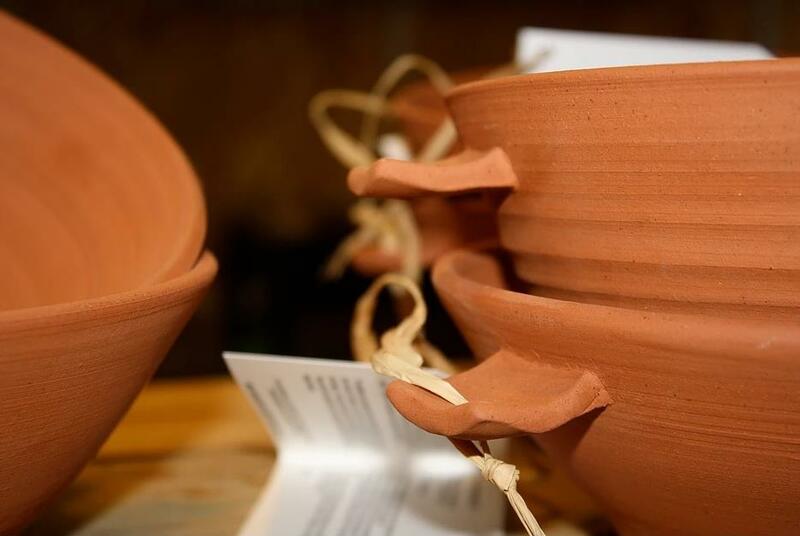 "prove and bake in one bowl"
Hand thrown using grogged terracotta earthenware clay and fired to a rich toasted terracotta, each bread pot is slightly different . The handles, as well as being part of the design, are a practical way of holding the pot to remove the bread and they look great hanging up in your kitchen. My pots are good for all types of bread and especially for sourdough, as you can prove and bake the loaf in the pot, retaining the texture and lightness of your dough. If you want the spiral pattern on the top, turn the bread out of the pot and give a few extra minutes in the oven for the crust to colour. Unlike conventional bread tins, once the pot is fully 'conditioned', my testers have assured me there are no sticking problems! To condition the pot - rub the inside and the top rim of the pot with any cooking oil and put in the oven for 20 minutes - repeat this 4-5 times. The temperature of the oven is not important - just put it in when you are cooking something else. Your fresh bread could be just over three hours away and it really isn’t difficult. You will need some flour, oil, yeast, sugar and water. First you will need a breadpot and we are here to help with that! Make sure your breadpot is conditioned (as above) before you set out to bake. First off get the yeast started. Put 125 ML boiling water in a measuring jug and add 2 teaspoons of sugar to it. Now add 225 ml of cold water and you will be ready to add the yeast so do that and stir it in. Set it aside for 15 minutes. While you are waiting, give your bread pot a light smear of oil and dust with flour (ideally a gluten free flour like oatmeal, but any will work). Now weigh out the flour 500 grams in total. I like a mix of wholemeal and white (200/300) but the choice is yours. All wholemeal tends to be heavier but is good for you. A mix gives a good textured loaf that tastes great. Add in the salt (10-12 grams) and mix well. My mum used to use a fork so I do too. It’s not hard work and hand mixing is very satisfying. By now the yeast should be getting excited with a good head on it. Slosh in some olive oil (1 - 2 tablespoons) and stir well. Pour this mixture into a well in the flour and stir in to the flour gradually. This will distribute the yeast evenly throughout the dough which will eventually become too stiff to stir so if you haven’t washed your hands, now is the time! Then use fingers to mix in the last of the flour to give a fairly sticky dough. Traditionally, bread needs kneading which is done to ensure everything is well mixed. Turn out the dough and knead (flatten, stretch, fold and repeat). Finally gather the dough into a rough ball and drop into the prepared bread pot. Cover with a tea towel to stop the top drying out too much and set aside somewhere warm for about 2 hours during which time the dough should roughly double in size. This will give you time to take the dog for a walk, tend the veggie patch or just have a solo dance party in your kitchen! After the 2 hours and assuming it’s all looking good, turn the oven on and adjust the shelves. I set my oven to between 200 and 225 celsius but if you have a fan oven then a bit less (180) will be good. Allow it to warm up and put the bread pot into the middle of the oven. I always leave the tea towel in place and remove it once the pot is in the oven. This stops your loaf collapsing. Set a timer for 25 minutes and when that time is up take the pot out of the oven and turn out the bread. It your pot is well conditioned and prepared it will drop out. If not gently work a knife around the edge. Return the loaf to the oven upside down and lower the temperature to 175 (160 fan) for another 25 minutes. At the end of this second bake remove it from the oven and allow to cool. Now is the time to get out some beautiful crockery and home made jam. Put the kettle on and by the time the tea is ready your loaf will be just about cool enough to try. Enjoy.